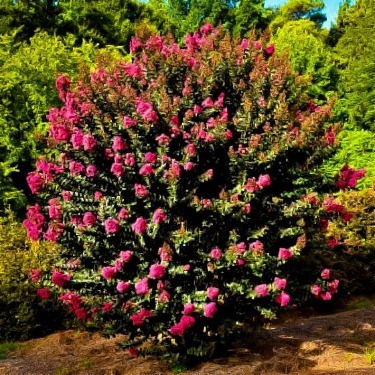 Crape myrtles have been favorites with southern gardeners for a very long time. Their resistance to heat and drought, combined with vibrant flowers produced over a long period, have made sure of that. But with changes in gardening styles they were increasingly seen as lacking something – colored foliage. The growth in the use of colored foliage in gardens has been enormous in recent decades. Helped by an ever-expanding range of shrubs with colored leaves, gardeners have learned how easy it is to bring color into their gardens for months and months, with leaves rather than flowers. So it was probably inevitable that crape myrtles would be the next group of plants to be gifted colored leaves – and that is exactly what has happened. Suddenly crape myrtles have appeared with rich, deep-red foliage, that is almost black, so deep is the coloring. In the past there were some – typically varieties with dark flowers – that had red leaves in spring, but that soon faded to green. Not so with these new beauties, which hold their deep color right through the heat of summer and into fall. They are also bred from varieties with high resistance to leaf diseases, so they stay clean and glossy all summer too, with no clouding of the color with dusty powdery mildew. 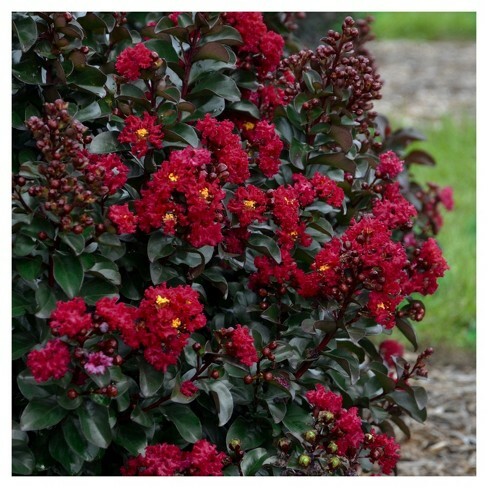 There are two main groups of black-leaf crape myrtles hitting the market – the Black Diamond range, and the Magic series. Both groups feature a range of flower colors to enhance and compliment the colored leaves, but both have a similar background. The breakthrough in breeding dark, persistent foliage started at the Mississippi State University, with a US Department of Agriculture breeding program. After doing literally thousands of crosses, in 2003 they came up with a variety they called ‘Chocolate Mocha’, which featured richly colored leaves of a unique dark brown/red-purple coloring. This plant also has bubble-gum pink flowers, and best of all, the leaf color didn’t fade as summer went along, but stayed strong right to the end. Rather than being the end of the road, ‘Chocolate Mocha’ turned out to be only the beginning. The plant was first taken up by a business called Plant Development Services Inc. and re-named Delta Jazz™. Other flower colors have been added since then, all under the Delta mark. ‘Chocolate Mocha’ was also used as a pollen parent by Dr. Cecil T. Pounders, a US Department of Agriculture scientist working at their research station in Poplarville, Mississippi. He created a whole range of beautiful plants, all with rich dark-red to black foliage, and with flowers ranging from pure white, through pinks, and into reds and lavenders. These he called ‘Ebony’, so there is ‘Ebony Fire’, a rich red, or ‘Ebony and Ivory’, with white flowers. These terrific plants are available to gardeners in the series called Black Diamond, brought out by J. Berry Nursery, in Texas, and available from top suppliers. The Black Diamond crape myrtles are all plants of medium size, between 8 and 12 feet tall, with upright, rounded growth. 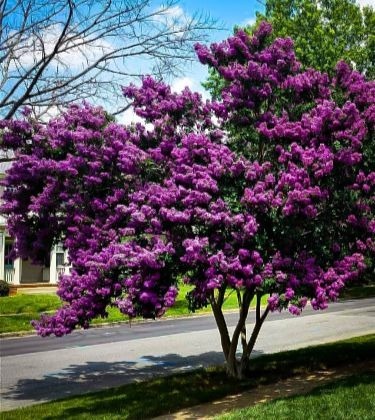 Like all crape myrtles they can be kept shorter and bushier by cutting them hard back in late winter, but the trend these days is towards a more natural look, with just a light trim for neatness. Use them as stand-out specimens in a smaller garden, always planting in full sun. the soil is not important, just so long as it is well-drained, because these plants are tough and drought-resistant. As for color, there is lots to choose from, depending on your taste and needs. A personal favorite is Pure White™, which is Dr. Pounders ‘Ebony and Ivory’ renamed for the Black Diamond series. Its white flowers really stand out against the dark foliage, creating a terrific contrast that works in any garden. If you want more color, there is lots to choose from. How about Best Red™ (‘Ebony Flame’) with super pure-red flowers, or Purely Purple™, a plant developed from the original series, with fabulous purple coloring. It would look fantastic as a background to pink flowering shrubs. Check out the rest of the Black Diamond series, and then make your choice – whatever you choose you will love the great color contrasts they bring to your garden. Of course, as we would expect, the flowers keep coming for months and months, from late June to the end of September in most areas. Dr. Pounder was not the only one to take up ‘Chocolate Mocha’ and run with it. No, the well-known plant breeder Michael Dirr and his company Plant Introduction Inc. also took that plant, collected seed from it, and growing many seedlings, looking for improvements. At their facility in Georgia Joshua Kardos did the hard work, and his best plants became the Magic series, with plants like Coral Magic™ showing wonderful salmon-pink flowers, or Midnight Magic™, with flowers of the deepest rich-pink possible. He also created that black/white contrast, with the white flowers of Moonlight Magic™. The Magic series has been made available by Bailey Nurseries, as part of their larger range of new introductions, called First Editions®. Plants in the Magic series tend to be smaller than Black Diamond plants, with some only 6 feet tall, but since they are new we don’t really know how tall they might eventually become. That also depends on where you grow them, how much you prune, and your garden conditions. So perhaps don’t plant them in front of a window, or somewhere were a few extra feet will create a big problem. Seeing how they end up is always part of the adventure of growing something new in your garden, so make allowances. The LSU College of Agriculture in Louisiana has planted all the new crape myrtle varieties, and will be studying how they develop, building more detailed information that will help us choose the best. Every year new plants are being added to these series of red-leaf crape myrtles. We can be sure there will be more treats in store, with a broader and broader color range, and different sizes for different spots in the garden. When planting dark foliage shrubs, remember they look best, and stand out more, if they are against a lighter-colored background, like the natural green of trees, or a white surface. Plant them with other shrubs that have light foliage and flower colors – variegated plants look terrific against those dark leaves, and ideally plant where the sun is behind you when looking at them. They will really stand out and make a statement if you consider these things – rather than letting them disappear into the background. Whatever way you use these terrific new crape myrtles, you will love the new look they bring to your garden – enjoy!